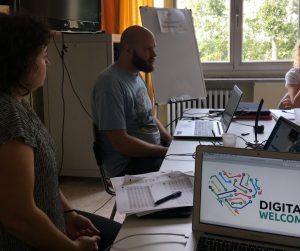 The 3rd partners’ meeting of the WELCOME project took place in Rome on 1-2 October and was hosted by our Italian partner Fondazione Mondo Digitale. After an exciting tour to their fab lab and a virtual reality painting experience, partners got down to business. A number of very important issues were on the table during this two days’ meeting, which took place at a key phase of the project. With the results of the first piloting round in their hands, partners discussed the lessons learned and the take-aways, what worked well and what didn’t, the pitfalls and the unexpected successes. All in all, working with refugees and asylum seekers was not easy but it was very rewarding. Except for the Greek partner IASIS (specialised in working with this target group), this was partners’ first training targeted to refugees and asylum seekers. Read this article about partners’ experiences during the training programme to learn more about how it went. Because piloting is a way to test a programme and make a reality check, we also needed to adjust it afterwards. This is what we discussed during the rest of the meeting – how to improve our programme and make it more relevant to the needs of our target group. Coding with Scratch was found too childish by some participants, so we decided to diversify this methods and include some Robotics. A link to more advanced programming languages will also be made. Participants were reluctant to share their stories during the digital storytelling part, so we agreed that trainers should help each other with ideas on what questions to ask. For example, instead of the usual “How did you arrive here?”, better ask participants “What do you think this new country can give to you?”. During the first piloting, the purpose of the digital journalism module was not very clear to some participants. They didn’t understand why they need to interview each other, so partners agreed to focus more on helping them find people in the community to interview, or do mock job interviews. We discovered that empowering the young refugees and asylum seekers to become mentors and pass what they have learned on to others was very important and decided to add the methods as part of the core curriculum. These are just some of the changes and additions partners agreed to. To sum up, the training programme and the four modules were not changed, because there was a high overall level of satisfaction among the participants in the first round, but partners agreed to reinforce some aspects, remove some redundant contents and activities, and make a better link between different “soft” and “hard” skills learning activities in the modules. The second phase of the piloting is expected to start already in October in Belgium and roll out in the other partners’ countries shortly afterward. Stay tuned!